Josh Eichorn: has the skin of a 10-year old boy. It’s mounted and hanging over the fireplace. President Bush is concerned about God Town as it is unknown just what the Gods are doing up in their floating, futuristic city. He is worried that they may be developing weapons of mass destruction and as they had made a deal with CyberFace, perhaps God Town is a hostile nation. Dragon has been called to the White House with the rest of the Liberty League as his part experience with the Gods makes him an ideal candidate to deal with the situation. Dragon warns that the Gods are far too powerful for them to risk upsetting and suggests that they should just leave them alone. The President does not seem to be listening and merely states that he hopes that Dragon will answer the call for help should his government contact him. The heroes leave and discuss the situation with SuperPatriot’s frustration over how Bush got elected boiling over. Battle Tank and he get into a political argument that ultimately ends with SuperPatriot abruptly quitting and departing. Meanwhile in Progress, Utah, the teenaged hero known as Firebreather talks with his friend Jenna Swartzendruber about his desire to fit in amongst his fellow students. She wonders if perhaps he secretly likes being an outcast but their conversation is ended when something tears through their school. Firebreather dons the mystical harness that his father once gave him and takes to the air in pursuit of whatever caused the damage. A press conference is held over the Gods situation and Dragon fields a number of questions from the media. He is asked why the S.O.S. as they are an official government sanctioned team but Dragon replies that his experience means that the Liberty League is an ideal choice for this particular case. Jennifer Dragon is asked a question but becomes so nervous that she starts rambling, embarrassing herself in front of the entire nation. At Ronald Vel Johnson High School, Mark Grayson is pulled out of his class for a telephone call from his father. It seems that Omni-Man is busy on a case with the Guardians of the Globe and requires his son’s help with a relatively minor incident. Mark changes into his Invincible costume before taking to the sky in search of the threat, eager to prove his worth as a hero to his father. 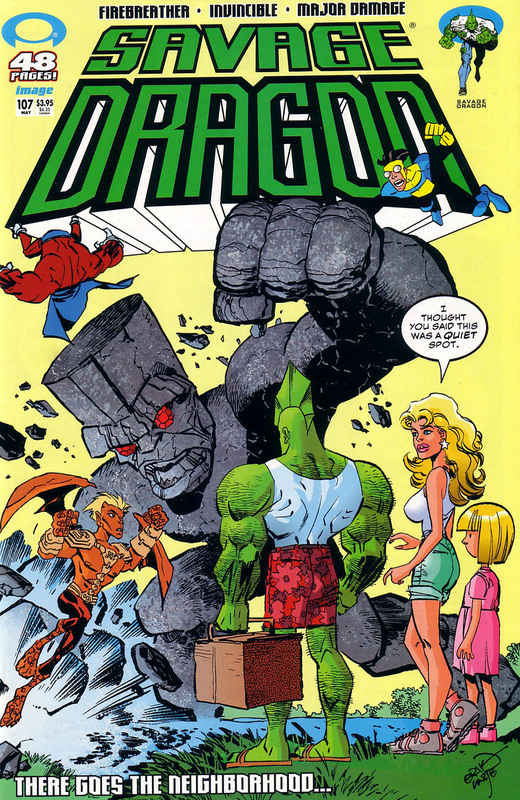 Dragon takes his family on a picnic in a Washington, DC park where Jennifer worries that footage of her at the press conference will be continuously brought up to mock her on television. A young girl named Addy Henrich wanders over to the group and shares a joke with Angel before her parents come rushing over to apologize for the intrusion. Dragon dismisses any concern and invites them all to join them, leading to some other people joining the conversation. This peace is interrupted when the rampaging Humongous charges across the park with Firebreather and Invincible trying to halt his progress. The creature’s old foe Major Damage had already been clinging hold of him when the other young heroes had joined the fray. Dragon sends all of his new friends back before him and Jennifer race into action. The combined might of all of these heroes eventually destroys Humongous, but not before it had crushed new friend Arnold Feeble to death with a footstep. Angel celebrates her parents’ victory but Jennifer points out that their fighting is not like in the cartoons and that a man is now dead as a result of the violence. Dragon is introduced properly to Invincible before talking with Firebreather who sees him as a role model, someone who is totally different to everyone else but that is accepted by society. Major Damage is too nervous to talk to Dragon and simply opts to run away instead. Jennifer is disturbed that people as young as these new heroes are out risking their lives to fight crime but Dragon points out that if they had not been there, even more lives may have been lost. The current incarnation of the S.O.S. arrives on the scene to check that there is no more danger. Dragon is annoyed by the mere sight of Sgt. Marvel and assures him that everything is safe. 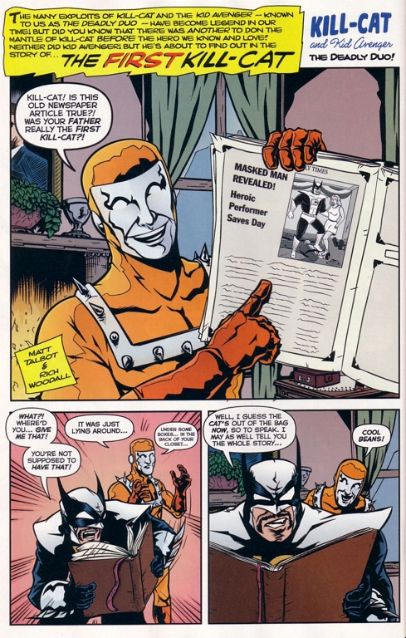 Melvin Grimes is a young boy who had been out celebrating Halloween by dressing up as his favourite comicbook superhero, Major Damage. He disobeyed his mother’s wishes and ran away from his babysitter in order to seek out greater goodies on his own. Unfortunately, his strange appearance is seen by hidden alien invaders. The strange Mucus Men abduct the child and take him aboard their vessel where they discover the existence of one of the comics featuring his idol in his pocket. Melvin Grimes is terrified by the experience and is unaware that the aliens wrongly believe that he is the actual superhero and has been regressed to a childlike state by some unknown threat. The comic is seen as the diary of the powerful superhero and the scared Mucus Men assume that if the hero is not returned to his true state then the Earth will become endangered by other alien threats. They then place Melvin Grimes into a device which then allows them to transform him into adult form, complete with superpowers, making him into Major Damage. With Major Damage now ‘restored’, the Mucus Men wish to see him in action and decide to recreate another character from the comicbook. They locate a statue of one of the Tiki gods and transform it into the deadly Humongous. The rampaging creature is opposed by his supposed nemesis and flees into the ocean to avoid any further conflict. This then leaves Melvin Grimes to return to his home where he decides he cannot remain for fear of putting his mother in harm’s way. He packs up his belongings before leaving a note for his mother and leaving.